I have a problem that I’m guessing you might have too. I get so caught up “taking care of things” that I forget to take care of myself. And then I get cranky. And my family feels it. And it really takes the fun out of things. But I’ve figured out a solution that TOTALLY works. Every time. It’s called my Stabilizing Mechanism. And I kind of feel ridiculous posting a picture of it, but in two separate interactions with close friends, I opened my planner to show them how it works, and they both asked to take pictures. I keep this on a sticky note in my planner (and the reason I use little drawings instead of a written list is because Nancy Duarte, author of Resonate, taught me that our brains think in pictures. I totally see that). And to give you a feel for how I use this list, I’ll describe what happened just this morning. Our family completed our move to a new home last night. We’re living out of boxes, eating whatever we can find in our kitchen, staying up super late, and working long hours to fix up the house, create order, and establish new systems for our family. We’ve kind of exhausted ourselves over the past few weeks. I woke up this morning after just a little bit of sleep and had to hurry to call two repair shops, get three of my children packed and off to their week-long youth camps with church, figure out the laundry situation, handle some important emails, and complete a bunch of other little tasks that “desperately” needed my attention. At one point in the morning, when I realized I’d completely forgotten an important, time-sensitive task, I lost it. My brain couldn’t take it anymore, and I sat in the corner of my room and had a total meltdown. Of course that was the perfect time to text Eric and tell him all about it–what a failure I was, how I couldn’t possibly get my feet under me, etc., etc. But then I remembered my Stabilizing Mechanism. Its main purpose is to keep me stable–before I even get close to a meltdown. But it also pulls me OUT of the craziness, which is why I love it so much. Essentially, it’s a “Routines Checklist”–a simple way to review all the little things that help me to feel calm and on my game. I opened my planner and realized that I hadn’t done ANY of these this morning. Guessing you saw that coming. Why do we sometimes wait until we are depleted in every area before we do something about it? “Because I feel great tonight, and then tomorrow I will totally forget, and we’ll have to start this process all over again?” I asked–kind of laughing, but secretly feeling a little sorry for my husband. 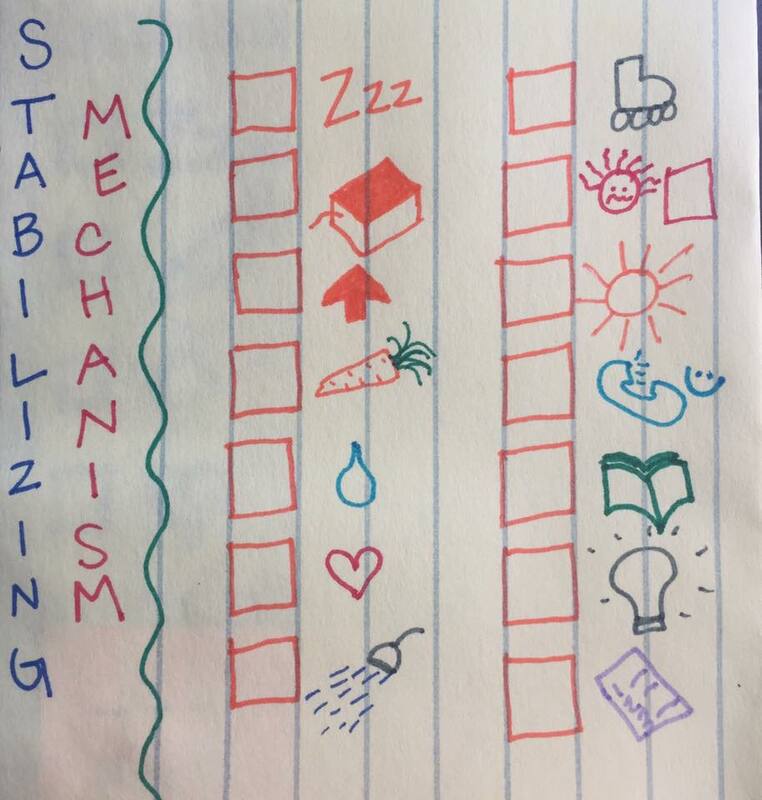 I am going to remember to look at my Stabilizing Mechanism every day, and I’ll plan my day accordingly–taking care of myself way before I’m about to have a meltdown. Yes, it seems like we “don’t have time” for all of this, and realistically, we don’t need ALL of these things every single day. But when we can accurately identify what we need in order to thrive, create a simple checklist using pictures that our brain can quickly scan, and then implement those routines, the results are staggering. Here’s to all of us being super happy this week–and onward. You know that meltdown you described here… I have it often. 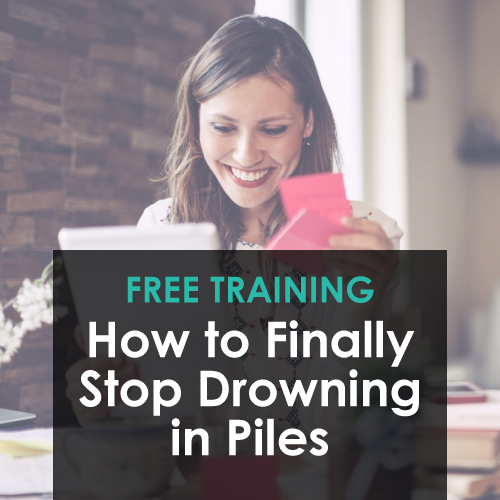 And because I don’t have time or haven’t taken the time to do this program I was feeling really guilty about spending the money on a program I wasn’t taking time to do! But I am going to commit to do the stabilizing mechanism every say adding Learn Do Become at the top after aleep for 30 days and then see where I am. Donna- thanks for sharing! This is great- glad you are finding some tangible steps for helping you with this, and glad you are here! Donna, Wow, you wrote exactly how I was feeling. Thank you for sharing. I started the steps again and I should have waited until school started. I can’t get going. Thank you April for this! It’s so reassuring to know that although you have a lot of knowledge and experience in the STEP program, you still have set backs. It’s not a perfect system, because life isn’t perfect, unexpected things come up all the time, and things pile up. It’s a constant work in progress. Often, we have to make adjustments and need reminding of what is important. Even though we know what is important, we do lose our way, so we have to be willing to take a step back and remind ourselves. One thing for sure, this system has definitely helped me get projects done and get my gears in order. It takes discipline, but it’s all worth it. I’m sooo glad I invested in this program. Thank you April for keeping it real. I thought of many more things to choose from when Im feeling “put out”, or etc. How about a piece of chocolate, a drink of tea, or putting on music? I wrote my list over time, adding fun things that cheer me. I like your idea of choosing them (one or more) ahead of time. I have totally had melt down days like that. Then I realize I didn’t eat healthy, didn’t exercise, didn’t read my scriptures, didn’t even get dressed, etc. No wonder I’m cranky:). I love the visual reminder. What a great idea. Thanks some much for sharing! I like this alot. Can we go about checking of this list in any order ? Absolutely! 🙂 It’s made to be customized. I use mine daily…. Good luck! Do you draw a new stabilizing mechanics each day? I’ve been calling mine daily MVPs (in my Wunderlist app because I can “unstar” them when they are completed), but I think I like the sound of stabilizing better. 🙂 Also, I’m very interested in your “doable task list” and about how much time you designate to your daily/weekly cleaning. What time of day have you found that is best to get all the mundane tasks of running a household into your schedule? I enjoy a clean and organized home, but if I’m not careful, I spend most of my time on cleaning and organizing and not on my next actions and context based lists. I have five children ages 13-3 and they do quite a lot of the family work, but I still get overwhelmed with how much there is to do just to keep the home clean, organized, and running properly. “m tired of spending all of my time on just upkeep. So basically, just wanted to pick your brain about how your days/weeks look with the mundane housework? Thank you so much for your questions! I want to be sure to fully answer each one, so I will reply via email. You are on the right track and you are accomplishing many amazing things in your home and life! Keep up the great work, and I look forward to hearing more success stories in the days ahead! I want the same email you refer to in this reply. I have 11 children, 5 are now out of the house onto college and work. Having the two girls move out was a strain since we girls naturally have more aptitude to stay on top of bringing order back from chaos. But with my five younger boys, it is more of a struggle since they don’t have the natural female instinctual motivations toward cleanliness, and have a higher tolerance for disorder. I see lots of progress, which keeps me going forward with optimism in teaching them, but now I feel my lack of holding them accountable very apparent to close this gap. Any tips you have would be appreciated. Rosalie, we sent you a message via email. Thanks for being here at Learn Do Become!! May I also get a copy of this email response so I can see what you do in real time? Thank you very much April! P.S. If you don’t have it anymore I understand, as it has been a month. Hi, Aly! Thank you for taking the time to comment here. 🙂 I can actually post the response that Jill sent here. Send a message to [email protected] to request a copy of the Create Your Day resource if you’re interested in that. 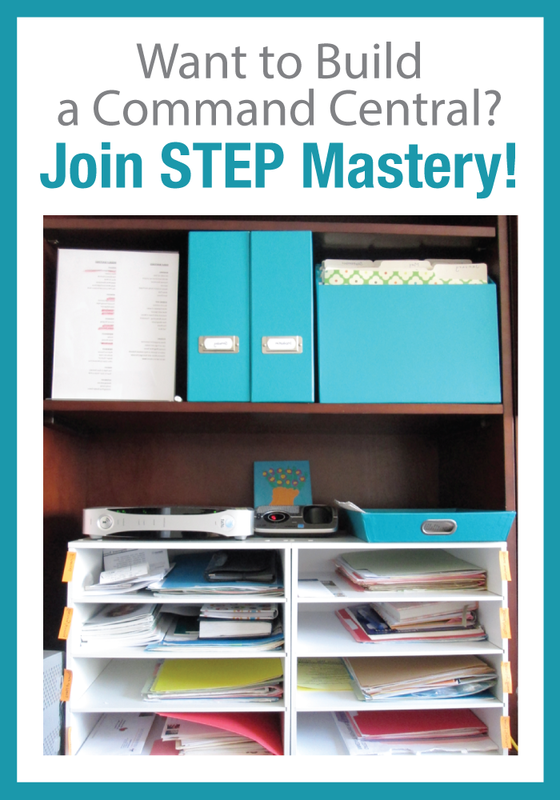 We’d be happy to share more about our STEP (Steps To Everyday Productivity) Programs as well. Those programs contain much more detailed information on how to schedule both routines and projects. Thanks again for your comment. We’re grateful to have you as part of our community! I have warmed to April Perry after many years of becoming a new mom (son is 7, stepchildren are 21). With as many great resources as she has shared parenting, self improvement, etc, I am still personally stuck in managing my home. I am very curious about your response to Suzette’s request about a ‘doable task list’ in her comment on March 1, 2018. If it’s not too much trouble, would you mind forwarding me the email you sent her!? PS I am signed up for the Mind Organization for Moms. Hello, Jenn! Thank you for taking the time to comment here. 🙂 I can actually post the response that Jill sent here. Thank you for being “real” and sharing this!! May seem simple, but so practical and usable because it is so real!